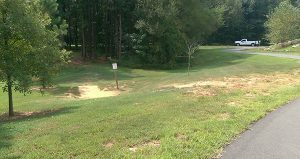 If you have played through NC State’s Centennial Campus disc golf course, the start of hole four probably didn’t stand out as much more than an eroded slope. But now — thanks to a partnership between an NC State graduate student and the university’s Grounds Management department — a large pollinator-friendly garden is both managing stormwater and providing habitat on campus. 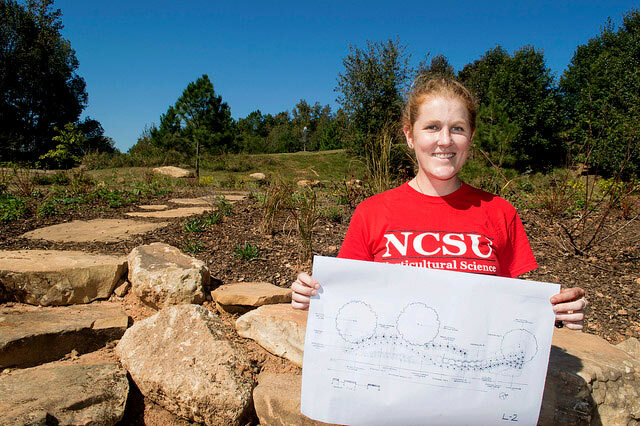 The new garden sprouted from the vision of horticulture student Melissa Tinling, who obtained an NC State Sustainability Fund grant to create a campus garden that would be both aesthetically-pleasing and supportive of native pollinators such as butterflies, bees and moths. Using a pollinator-friendly plant list developed by Chatham County Cooperative Extension agent Debbie Roos, Tinling designed the garden that, when in full bloom, will feature blueberries, pops of purple from coneflowers, shades of yellow from black-eyed Susans and texture variations from a variety of ornamental grasses. 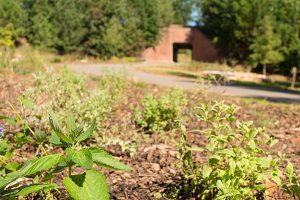 Located just under the Main Campus Drive bridge near Initiative Way, Tinling and Grounds Management selected the garden site because of its proximity to a well-utilized greenway trail and the student-led SOUL Garden, which will benefit from the influx of new pollinators. The garden project also allowed Grounds to address the site’s long-standing runoff issues. Planted by more than 20 student volunteers and Grounds Management employees in mid-October, the garden is now part of ongoing campus maintenance efforts, though Tinling hopes to organize a service day at the site in the Spring. To further spread awareness about the importance of pollinators, she also plans to develop a website detailing other pollinator-friendly locations on campus. Published in Land, News, Students, Uncategorized.